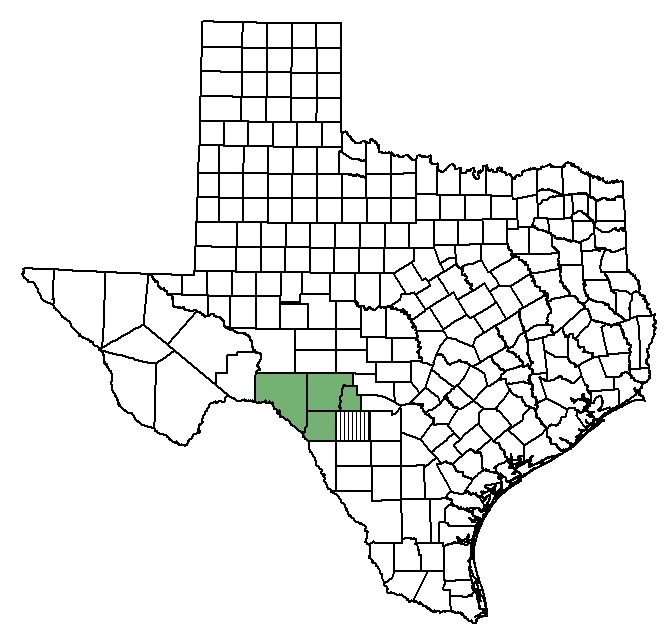 Distribution map of Texas snowbell (Styrax platanifolius ssp. texanus). Texas snowbell are native to the drainages of the Nueces and Devils rivers in Edwards, Kinney, Real, and Val Verde counties on the western Edwards Plateau of Texas. They have been introduced in Uvalde County. Texas snowbell is a deciduous shrub that emerges single-stemmed, but as it matures, grows multiple stems from its base. The plant is 1-6 m tall with smooth, gray bark and almost round leaves (2.5-7.5 cm across). Leaf edges are smooth or slightly wavy. The leaves are bright green and hairless on the upper surface, but have a thick layer of microscopic star-shaped white hairs on the lower surface. Leaf veins are arranged in a feather-like pattern, with one main, prominent vein in line with the leaf stalk and multiple smaller veins branching off the main vein. Usually 3-5 flowers hang downward from the same flower stalk, which arises from the same point as a leaf. A very pale green, bell-shaped structure (4-6 mm long and 4 mm wide) cups the base of each hanging flower. The five white flower petals are narrowly oval and 14-20 mm long. Ten male reproductive structures hang from the center of the flower, bearing bright orange pollen. A round, three-sectioned, 7-12 mm wide fruit eventually splits open to reveal (usually) one shiny brown seed. Texas snowbell leaves are hairless on the upper surface, but have a thick layer of white hairs on the lower surface. Hanging flowers have five white petals and orange pollen. Credit: Jackie Poole - Texas Parks & Wildlife Dept. Texas snowbell has almost round leaves and mostly smooth leaf edges. One main, prominent leaf vein continues from the leaf stalk and multiple smaller veins branch off the main vein. A pale green, bell-shaped calyx cups each flower. Without flowers, Texas redbud (Cercis canadensis var. texensis) can be confused with Texas snowbell, except that the lower leaf surface is hairless in Texas redbud, and it has multiple prominent leaf veins radiating out from the point where the leaf attaches to its stalk. 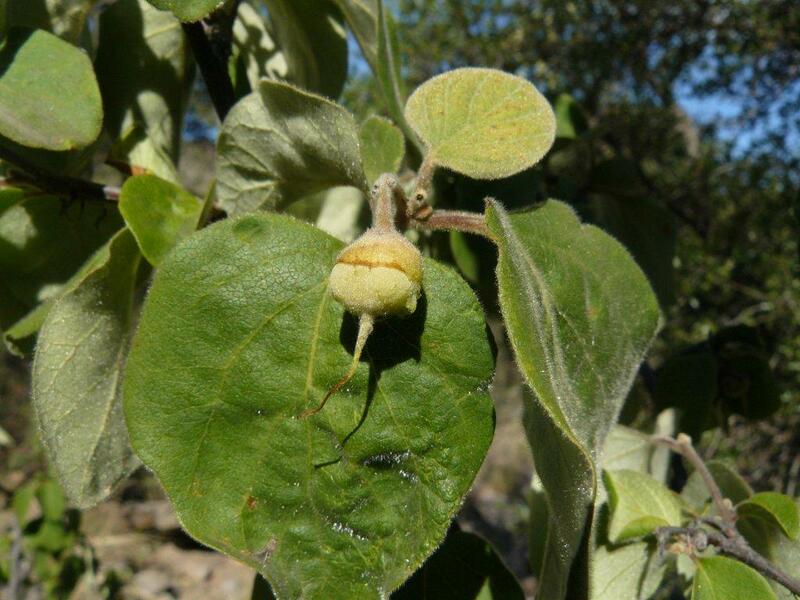 Three other closely related snowbell occur in Texas: hairy sycamore-leaf snowbell (Styrax platanifolius ssp. stellatus), sycamore-leaf snowbell (Styrax platanifolius ssp. platanifolius), and Young’s snowbell (Styrax platanifolius ssp. youngiae). Young’s snowbell is only found in West Texas, whereas the other subspecies have overlapping ranges in the Edwards Plateau. Below are tables that can be used to distinguish between the four subspecies, depending on available material. If possible, always use as many characteristics as possible to identify plants. Although similar in appearance to the leaves of Texas snowbell, leaves of Texas redbud have a hairless lower leaf surface and multiple leaf veins originating from the point where the leaf attaches to the stalk. Hairy sycamore-leaf snowbell leaves have scattered hairs on the upper and lower leaf surfaces. Sycamore-leaf snowbell leaves have no hairs on the upper and lower leaf surfaces. Young's snowbell leaves have scattered hairs on the upper leaf surface and a thick layer of hairs on the lower leaf surface. White, star-shaped hairs on flower stalk? White, star-shaped hairs on calyx1 edges? Lower leaf surface hair present? Scattered hairs on upper leaf surface? Texas snowbell grow on limestone cliffs, slopes, and gravel streambeds along permanent or periodic waterways. Habitat of Texas snowbell (tree with blooms in center of image). Flowering occurs from March to April and fruiting begins in April with fruits ripening and releasing seed in late summer or early fall. Germination occurs in spring. For the most accurate identification, Texas snowbell should be identified while in bloom in March and April. Various animals on the Edwards Plateau are heavily browsing the Texas snowbell population along the Nueces River. 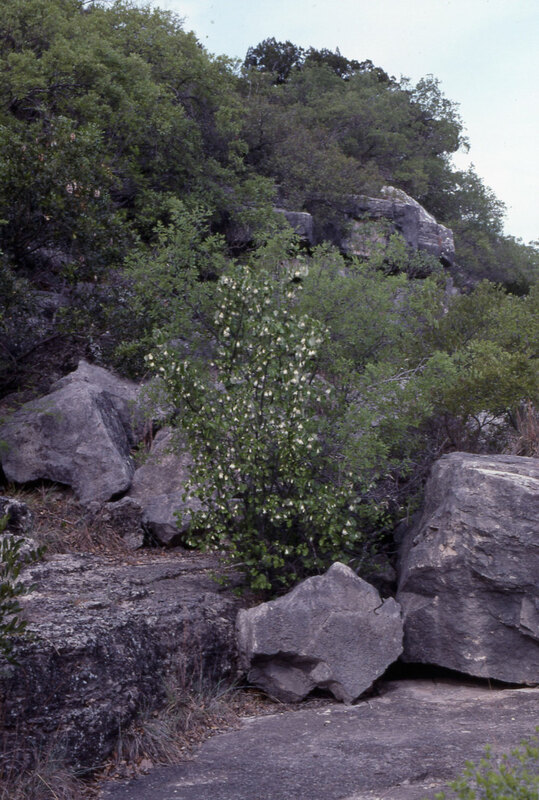 Establishment and reproduction of Texas snowbell has been so limited that plants are now confined to vertical cliffs and other hard-to-reach areas. For plants to grow in accessible sites along the river, cages must be utilized and maintained. Fulton, S. 2010. Status assessment and ecological study of Styrax platanifolius ssp. texanus. Section 6 final report. Austin: Texas Parks & Wildlife Dept..
Poole, J.M. 1993. Reproductive biology of Texas snowbells (Styrax texana). Section 6 final report. Austin: Texas Parks & Wildlife Department.